It's not fun to dwell on the difficulties of your first year, but I also know that by this point in the year you might be feeling overwhelmed or even discouraged. If you are, I hope that you have a great support system within your school to help you out, whether it's your mentor teacher, an administrator, or just a teacher friend. I feel like I had two first years of teaching because I spent a couple years in a special education teacher role, then switched gears to a kindergarten classroom position in a new building for my third year of teaching. It was what I wanted - my dream job, even - but it really did make me feel like a first year teacher all over again. When I say "struggling", I mean a variety of different things and, to be honest, I don't even like using that word. Maybe your struggle is an internal battle with confidence or anxiety. 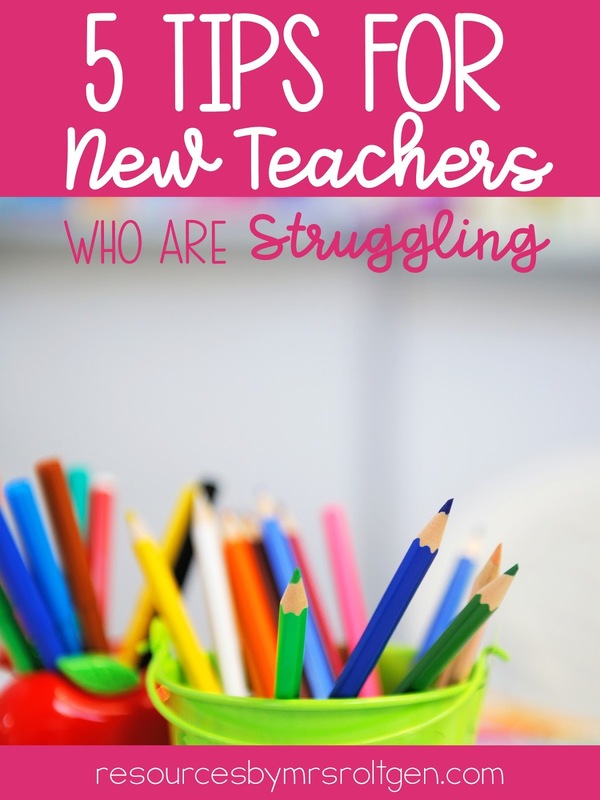 Or perhaps you have a class with kiddos who struggle academically or behaviorally. Sometimes, sustaining the energy you need to push on and meet all the needs of your 20+ students is almost too much to bear. I put together five tips that you can try tomorrow. I hope that at least one of these tips will help you! Tip 1: Ask to observe another teacher. If there's an area where you lack confidence or something you're just needing ideas for, ask your administrator if you can observe another teacher. Especially if there's a skill area you think your principal might bring up at observation time, act now! Most principals will admire you if you come to them and say, "I'm looking for some ideas for my center rotations and I know _____ really has this going well in her room. Would it be possible for me to observe her sometime in the next couple weeks?" You'll feel better for acknowledging an area for potential growth before your evaluation instead of waiting for your administrator to bring it up. 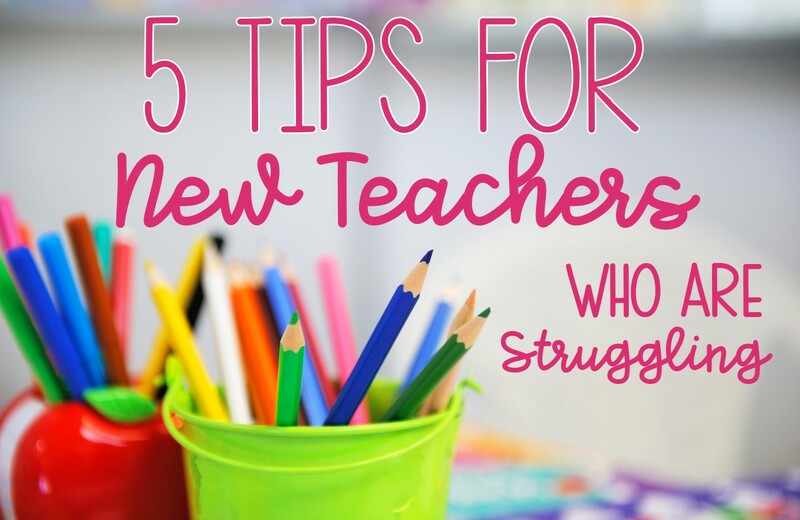 Tip 2: Think about the teachers you had growing up. If you're feeling disillusioned about your first year, make a list of things you remember about your teachers. What are some fun things they did? What made them memorable to you? You can also think about some of the mentor teachers you had during practicum or student teaching placements. One of my cooperating teachers in a practicum used "smelly stars" as a reward, which was drawing a star on the back of students' hands using Chapstick. I remembered this on a difficult day I had in the middle of my first year teaching kindergarten and, as silly as it sounds, it helped lift my spirits. I grabbed a few containers of chapstick from Target that night and incorporated it the next school day. Although it was a small addition to my day, it helped me reconnect with an example of a great teacher from my past. Tip 3: Try to simplify your teaching life. Are you trying to do too much? Most teachers have too much on their plates through no fault of their own. 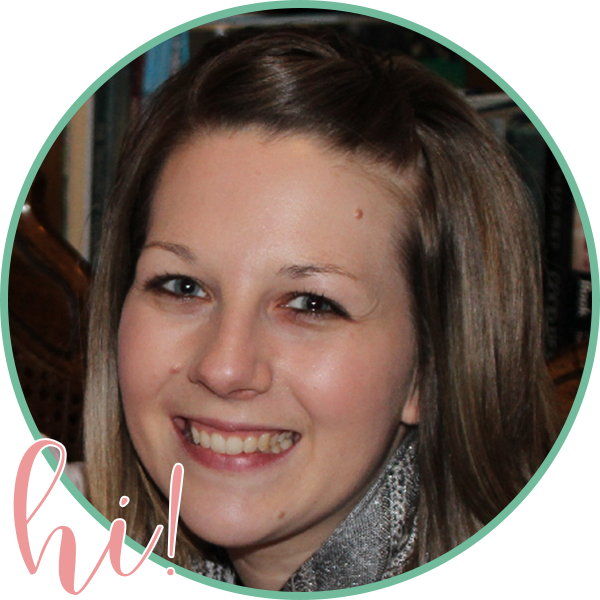 In my first year teaching kindergarten, I also had just given birth to my first daughter. With so much on my plate, I had moments where I felt like I had an insurmountable amount of work to do every day. One day, I stepped back and realized that I was majorly over-planning and, as a result, wasting a lot of my planning time and personal time. I had a fear of not having enough activities planned for the day, but I was going to way too much work. 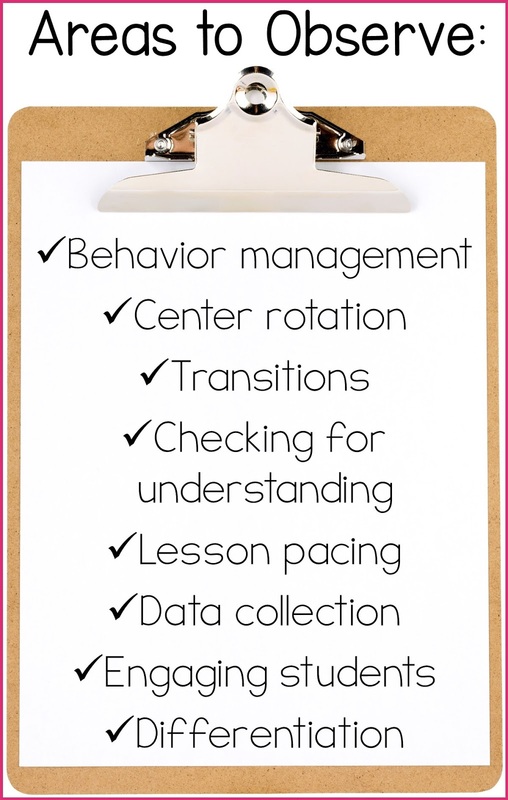 How are learning centers going? Are you spending too much time planning or making what the other students will be doing while you're with a group? Consider ways you could simplify the planning process, such as reusing a previous activities as re-teaching tools, especially anything you've done as a whole class, or purchasing pre-planned centers from TpT. How are your mornings going? Are you spending too much time planning morning work? Are you and your students struggling with the routine or lack thereof? Is it chaotic? Could your students work on morning tubs to ease into the day? How is your prep time going? Is it over before it begins? Can you create a better template for your lessons? Can you and another teacher on your team work together on making copies for each week? Can you share lesson plans or ideas and then change up things where necessary for your students? Tip 4: Snooze your teaching-related social media. I'll begin by saying that if teaching-related social media is truly inspiring you and not stressing you out, then please ignore this tip. BUT! Promise me that you won't let social media stress you out. Quite frankly, social media has a way of making us feel inferior as women, mothers, and teachers. I can't tell you how many times I've caught myself comparing my life as a teacher and/or mom to someone else on Facebook or Instagram. It's so, so, so unhealthy. As far as teaching blogs on Instagram, I will tell you that I'm not even in the classroom this year and it even stresses me out. I truly love seeing the incredible things that teachers are doing in their classrooms! I really do! The problem is, if you're struggling in any way as a new teacher right now, seeing all of the picture-perfect classrooms online is probably not going to help you feel much better. What you won't see in most of those posts are the countless hours the teacher has put into those ideas, or that the teacher has been teaching for several years, or that there are still areas where that teacher is continuing to grow. Social media doesn't show us the whole picture. You can still use all of the great blogs and teacher resources out there. Use Pinterest or Teachers Pay Teachers to search for specific ideas and inspiration. It will help you focus on the next lesson or theme you're going to do, or on the area where you need some help. Tip 5: Give yourself some grace. I know you've heard this before, but I mean it from the bottom of my heart. You do not have to be the perfect teacher to have a successful year. You are still the best teacher for your students because you care and you know them. You will make it through this school year. And along with giving yourself some grace, treat yourself! Seriously. If you're anything like me, promising myself a little treat works wonders. Schedule a pedicure. Treat yourself to takeout. Go to a coffee shop and read a (non-teaching-related) book. Hide some M&Ms in your desk at school and snack on them throughout the day. Whatever works for you. You are a teacher but you are also a person and self-care is truly where it's at.